As we still need Pride parades because there are still bigots out there who refuse to accept that LGBT+ people have the right to exist, we need Women in Horror month because there is still a preconception that women don’t do horror. Things are changing, slowly, but there is still work to do (in both of the aforementioned groups). Hence, I have been busy pimping myself this month, and I have things to report. I am pleased to announce that the 43rd edition of the e-zine ‘The Siren’s Call’ – an all-female edition for Women In Horror month – is now out. It contains my story ‘Cigarette Burns’ as well as lots of other stories and poems by fabulous women horror writers. The issue is available to download free of charge from The Siren’s Call site now. I had a guest blog post on Colleen Anderson’s site this month, about why I write horror. You can have a read here. More good news to report here – the sequel to OUTPOST H311 is officially underway. I haven’t written too many words yet, but I have made a start on the first chapter, and I’ve made progress in plotting and character sketches. I feel like I am gently, but firmly, coaxing my muse out from the rock it’s been hiding under, and it’s starting to wake up. I have also thought of a title for said sequel. I want to call it ‘OUTPOST: ARMAGEDDON’. I’d like to know what people think of this. And that’s it to report for this month. See you at the end of March! There’s a bit of a convoluted story attached to the song for this, so bear with me. In 1979 my mother married my stepfather and he moved in with us, and my sister and I saw my dad during weekends and school holidays. I guess we’d more or less got accustomed to this arrangement now, but I was still suffering badly with nightmares. And one of the things that always seemed to trigger nightmares – from early childhood it seems – was distorted and featureless faces. There were a few things on TV in the 1970s that I vividly remember giving me nightmares. One was the fembots episode of ‘The Bionic Woman’, when the fembots took their face masks off, revealing a pair of eyeballs in a maze of electronic circuits. There was an episode of ‘Sapphire and Steel‘ where the supernatural entity removed Sapphire’s face (I can’t find the name of that particular episode). There was also an episode of the original ‘Star Trek’ where a supernatural teenager removed the features from a woman’s face for laughing at him. All of these things rather jumped out at me without warning while I was watching TV as a child, freaked me out completely and gave me nightmares for weeks. 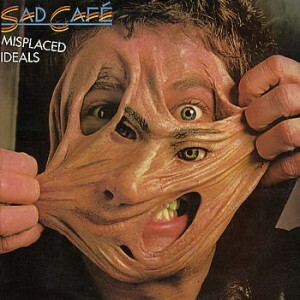 And there was the album cover of a band called Sad Cafe, called ‘Misplaced Ideals’, which I am including below. My memory of this is that I was walking through Ashton during the Whit Walks with my sister (referred to in the post for 1978), and this poster was stuck up everywhere. We talked about how it freaked both of us out, and we didn’t know exactly what it was advertising, but I thought maybe it was a film. Since then I’ve done some research into this. The band Sad Cafe were from Manchester, which explains why posters advertising their album were all over Ashton-under-Lyne. But the album ‘Misplaced Ideals’ was released in 1978, not 1979. I do remember that this image featured in my nightmares for rather a long time. And the next time I came across Sad Cafe was when their biggest hit was in the charts in 1979. And every time I heard the song on the radio I remembered what I thought of as the scary Sad Cafe image and it gave me nightmares all over again. I look at this image, and it still freaks me out, although as an adult I don’t suffer from nightmares the way I did as a child. I have been trying to analyse for years what it is about blank or distorted faces that freaks me out so much. I think perhaps it’s connected to a primal fear of loss of identity. Is this a common fear? Does anyone else get freaked out by images of distorted or blank faces? The story connected to the photograph for this year is slightly happier. It was taken by my grandfather, who was a keen amateur photographer. He had a real eye for detail and probably was good enough to be a professional photographer, but he was a working-class Lancashire mill worker and probably didn’t consider that such a career was open to him. This is my favourite photo of me as a child, because I think it captures the essence of who I was then, and I still look enough like ‘me’ to be recognisable as the adult I would become. I recall it being taken – in the local park. My memory is that it was taken on or around my tenth birthday, so it was autumn. Life would change quite dramatically for me, for the second time in my short life, in just a few months, but we’ll get into that in the next post. Meanwhile here’s the song for 1979, and one that still makes me think of that creepy album cover: ‘Every Day Hurts’ by Sad Cafe. It’s been a while since I posted a monthly update. Mostly because I haven’t had much to report. I am pleased to announce that my short story ‘Cigarette Burns’ will be appearing in the 10th Women In Horror issue of THE SIREN’S CALL‘ e-Zine (issue #43). This is the second year I have appeared in the special WIHM issue of this e-zine. I’ve really not been pimping myself of late, so nothing to report. This is where it gets difficult. I’m still trying to get my writing mojo back. I have several works on the go, but struggling with all of them. The fourth Shara Summers book I have recently done a bit of work on, but since I still don’t know what’s happening with the third Shara Summers book, and the first two really aren’t selling, I am not sure if there is any point in my carrying on with this series. 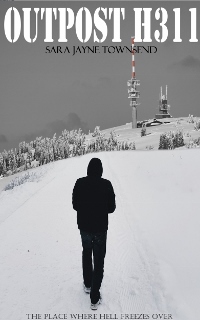 The collaboration I have been working on with Hubby – a rather sweeping crime thriller set in the 1960s – I have put to one side because I think there are so many problems with it I don’t know how to fix it. And finally, there is the sequel to OUTPOST H311. Which I do want to write. The first book seems to be doing reasonably well, sales-wise. The problem is I haven’t finished plotting the sequel yet, and that stage of staring at a blank page wondering where to start is even more overwhelming than usual. Hopefully by the end of next month I will have something more positive to report. In the meantime, if you’ve read any of my books I would really appreciate it if you could consider leaving a review. Knowing I have a few readers out there provides more encouragement to a writer than you could ever imagine. Once more it’s time for me to review the books I read in the previous year and blog about the ones I liked the best. My criteria for this is quite simple. I log all the books I read on Goodreads, and those I give a 5-star rating make my ‘best books’ list. This list includes one science fiction book, two crime novels (both sort of historical, but one decidedly so), and four psychological thrillers. Further details on each book can be found below. The only science fiction book on my list, this is a novel that was recommended to me and when I went to buy it on Kindle I discovered my husband had already bought the Kindle version – we have linked our accounts, so we can each access books bought by the other. Someone else had recommended it to him, completely independently. We both read the book, loved it, recommended it to our D&D group and then when the film came out a couple of months later we all went to see it together. Set in a dystopian near-future, where everyone escapes their appalling reality by spending all of their time in an idyllic Virtual Reality universe, part of what makes ‘Ready Player One’ so enjoyable are all the references to 80s pop culture. Anyone who grew up watching films, playing video games and playing D&D in the 1980s will recognise all the references. The film is quite different from the book, but equally enjoyable. If you saw and loved the film, do yourself a favour and read the book as well. In my review of ‘Everything is Lies’ I described it as ‘a near-perfect psychological thriller’. Helen Callaghan is a member of my writing group, and it’s so lovely to be able to watch an author grow and develop in their craft, and eventually produce something of this calibre. This the first of several psychological thrillers in my list. It’s a genre that is in danger of being overexploited. To be able to do one this well, in such a crowded market, is exceptional. I was given this book for Christmas in 2017, and I had no idea then that it would prove to be the last Sue Grafton book ever. She sadly passed away not long after, and her family announced they would not be finishing the series on her behalf. I’ve been reading the Kinsey Millhone series for decades, and I’ve enjoyed every single one of them. Because I had this one in hardback, therefore making it difficult to carry around with me, I read it when I was confined at home recuperating from surgery in February 2018. The fact that it was Kinsey Milhone’s last case added extra poignancy, but it was an outstanding story. I have a great deal of admiration for a writer who had 25 books in the same series published, and there was never any drop in quality. Ms Grafton left us too soon, and she is greatly missed. Sarah Pinborough made my list last year with ‘Behind Her Eyes’. This year I read the next psychological thriller she brought out, and while the twist ending is perhaps not as legendary as BHE, this is still an excellently written novel that had me gripped to the end. Everyone had been raving about this book, so I thought it was about time I got around to reading it. It’s a psychological thriller about a family that produces extraordinarily beautiful young women, but there’s a dark secret running through it. It’s not exactly a happy read, but it stayed with me for a long time after I read it, and it’s rare for books to do that. You can read my review on Goodreads here. Yet another psychological thriller, this is a story told from the point of view of Hanna, mother of two daughters. Three years on from a brutal attack that killed her husband and left her disfigured, Hanna is still trying to pick up the pieces of her shattered life. Her youngest daughter’s boyfriend was arrested and found guilty of the attack. Hanna can’t remember exactly what happened the night of the attack, but is fixated with finding out. Because she finds herself entertaining the unthinkable suspicion that her daughter was somehow involved. Again, this is a somewhat disturbing read, but it had me gripped. Find my full review here. The latest book in the Matthew Shardlake series is the most epic yet – spanning 850 pages and dealing with the peasants’ revolt in Norwich in 1549. I really hope that this isn’t the last Shardlake book, but I understand that CJ Sansom has cancer. This illness has taken far too many fine writers from us in recent years. This concludes my list of recommended reads for 2018 – those books that I thought stood out above all the rest I read throughout the year. This year, I’ve once again set the bar at reading 70 books. I have high hopes that I will make my target this year. I make no secret of the fact I hate sports. I have no hand-eye co-ordination and no dexterity. I can’t catch, I can’t throw, I can’t run without falling over. It’s been this way for me since childhood. I was always happier curled up reading a book than I was running about outside. I hated physical education lessons and I was always last to be picked for teams. And because I am assuming this barbaric practise doesn’t happen in schools any more, let me enlighten those of you too young to experience this. ‘Picking teams’ was when the teacher couldn’t be bothered to divide the class into teams, so they would get the kids to do it instead. The teacher would choose two team leaders – generally those who were good at sports. The team leaders would then take it turns to select the people in the class they wanted on their team. Naturally they picked their friends first. Then the kids who were good at sports, and the cool people. This is why I hated PE. And then we moved to Canada when I was ten years old, and my misery was exacerbated in a country that places a great emphasis on sports. Canadians are born knowing how to play baseball, it seems, and they all get put on ice skates at the time they learn to walk. I was made to play baseball with the school, but I didn’t know how to play and I was too shy to ask, and everybody shouted at me when I got it wrong. A few weeks into our new Canadian life my class went ice skating. It never occurred to anyone to ask me if I’d ever been skating before (I hadn’t). I spent the session holding onto the side of the rink, and my classmates were fascinated – they had never met anyone who didn’t know how to ice skate before. All this led to an insecurity that persisted through adolescence. Because I was no good at sports, I was somehow inadequate as a person. An inferior human being. Worthless. When I got to high school I was able to drop gym class, which I did, like a stone. But it took me a long time to get over those feelings of inadequacy. That not being good at sports did not necessary make me worthless. That it was OK to be a non-sporty person and that there were other things I was good at instead. Like writing stories. The psychological scars of all this are still with me. But I have learned to regard exercise the same way I regard vegetables. I don’t like either, but they are a necessary part of a healthy life, so they must be tolerated. I have spent all of my adult life trying – and failing – to get fit. I have listened to all the advice: “look for an activity you enjoy”. But I don’t enjoy anything. Some things I can tolerate, like swimming. Some things I can’t, like pilates. “Stick with it, and you’ll eventually get that buzz from a good workout”. For over 35 years now I have been embarking on various forms of exercise, and I have never once experienced that “buzz” that people talk about. But I am turning 50 this year, and I am now worried about the consequences of poor health in old age. So I am trying a new tactic. I am going for regular sessions with a personal trainer. I was very nervous about starting this. I was imaging someone like Mrs Parker, who would shout at me for being lazy or not trying hard enough. Thankfully, this fear proved to be unfounded. For a few weeks now I have been doing weekly one-to-one sessions of 25 minutes, in the local park. I haven’t been particularly enamoured about this – as well as not liking exercise, I’m also not a fan of the outdoors. But Karen has been very supportive. Each week we try different types of exercise and she guides me through what I need to do, being mindful of what my limitations are (arthritic knee for instance) but always trying to get me to push just a little farther. Today she said she was impressed with the speed at which I was picking things up. The exercises involved a medicine ball, with some throwing and catching, which I was better at than I was expecting to be. “Who said you were rubbish at games?” she asked me. “Everyone”, I said. And she said that I just need more confidence. So far, then, this mode of exercise has been going quite well but I am aware it is early days. Having someone who’s expecting me to turn up has helped me stick to this, and I do appreciate the one-to-one session, as Karen can focus on my technique and correct me when I’m not doing something right. So, a shout-out to Karen of Be Epic, for her patience and tolerance and willingness to help me improve my fitness level. It might be slow going, but at least I’m doing some form of regular exercise now. And to finish, because it sums up my attitude to exercise and weight loss, here’s a spoof of Adele’s ‘Hello’ by Dustin and Genevieve, called ‘Hella Cravings’. It makes me smile and nod every time I watch it. This year hasn’t been a particularly good year for me, for various reasons. At the beginning of February I had to have surgery for a vaginal prolapse, and although this is a fairly minor operation, the recovery time took far longer than I was anticipating. It was two months, really, before I felt fully recovered and I had underestimated how much the recovery process would take out of me. Then, in June, I was hit by a bombshell when I found out I was to lose my job. Having been with the same organisation for nearly 13 years, the prospect of having to go back out into the job market was daunting, to say the least. The worst part of it all is that since that day in June, when I was faced with this news I haven’t written a single word. Not one. Initially, all my energy was going into getting my CV up to date and applying for jobs, a process I hadn’t had to do for so long I had forgotten how time consuming it can be. Fortunately I found another job fairly quickly, but after having been so long in one organisation, having to be the ‘new girl’ again and learn everything from the ground up was quite exhausting. And then by the time I’d settled into the new job and felt comfortable in it, I had just been too long away from the writing routine to get back into it. Hence, my resolution from last year of completing another novel by the end of 2018 remains depressingly unfulfilled. So all in all, I will be glad to see the back of 2018. 2019 is a New Year, and I am in a new job, but it’s an uncertain time in British politics and I am also acutely aware of the fact that nobody’s job is guaranteed in this day and age. The wider picture is too overwhelming, so I am starting the new year with a few personal goals to focus on. Get back into a healthy diet and exercise routine. I always say this every year, but I am currently facing the depressing fact that I can’t fit into half my wardrobe these days. I have already made a start on the exercise routine, because I’ve just commenced sessions with a personal trainer. But I need to stick with it, and I need to be more disciplined with the eating regime. More fruit and veg, less chocolate. Realistically this is not going to start until all the Christmas chocolate is gone. Make more time for friends. Social media makes it easier to stay in touch with people we don’t see very often, but it doesn’t match face to face contact with friends. There are people in my life I consider good friends, and I haven’t seen nearly enough of them this year (in some cases, not at all). That has to change next year. And finally, and most importantly, I need to get back into the writing routine. Back to the early-morning writing sessions in a coffee shop before work. Back to regularly scheduled writing time. I am not going to set a goal of finishing a particular manuscript this year, because at the moment that seems too overwhelming. I just need to get back to writing. So these are the resolutions I am making as we head into 2019. Happy New Year to all. What are your goals for the forthcoming year? This year, FantasyCon is heading up North to Chester, a town I remember visiting as a child – mostly because there was a nice zoo there. That was over 40 years ago, and no doubt it’s changed a lot since then. However, this weekend I go back there again for my annual fix of all things horror, SF and fantasy. It seems I’ve got a rather busy programme this year, and all the cool kids are posting their FantasyCon activities, so here are mine. 9:30pm – ‘Occult and Supernatural Adventures’ panel in the Edward Room. Pete Sutton moderating. My fellow panelists are Mike Chinn, Sue Tingey and Georgina Bruce. 3:30pm – ‘Writers and Roleplaying Games’ panel in the Edward Room. Alasdair Stuart moderating. Fellow panellists are Danie Ware, Allen Stroud and Gavin Smith. I will also have copies of both ‘The Whispering Death’ and ‘Outpost H311’ for sale on the BFS table in the dealer room, and will likely be hanging around in the bar for at least part of the time. And I might make an appearance at the karaoke on the Saturday night. I never could resist a good sing. So, looking forwarding to catching up with friends old and new in Chester this weekend. Don’t be afraid to come say hello if you see me. Don’t listen to the gossip – I am quite harmless really , and I’ll be wearing a prominently displayed name badge so you can identify me. In 1978 I was living with my mother and sister in a small council flat, and my sister and I went to stay with my dad every other weekend. We were still living in Mossley in Lancashire, but we were now on the other side of it. Mossley was, and still is, a small town. The church was often the centre of the community in small towns, and it certainly seemed to figure prominently in our lives at that point in time. My sister and I went to Sunday School at St George’s Church, and I went to the same church hall once a week for my Brownie pack meetings. I remember the vicar coming round to talk to my mother about cleaning jobs, which she was looking for. As a single mother she was working three jobs around feeding us, taking us to school, picking us up again, and putting us to bed. I never realised that at the time. The church was involved in a lot of fetes and festivals, and Whitsun in particular, taking place in the Spring a few weeks after Easter, was a big deal. Every year at this time we had the ‘Whit Walks’, which appears to be unique to the North West of England. There would be a big parade through the town, and everyone who belonged to any of the churches would participate. My sister and I would both get new dresses for the occasion, and we’d join the parade, walking through town and waving at people who lined the streets to watch. Each church also crowned a ‘Rose Queen’ every year. As far as I can tell the Rose Queen originates from the May Queen, but I can well understand why the Christian church changed the name – the May Queen has somewhat sinistar pagan origins connected to virgin sacrifices. The ceremony would be held at the church with all the queens from the neighbouring churches in attendance for the ‘coronation’. Sunday School took place in the church hall, and although everyone was in the same hall there were lots of tables in there and the classes were divided up by age (and apparently by gender). In 1978 it was my Sunday school class – a group of eight-year-old girls – from which the Rose Queen was chosen. The honour went to the girl with the best attendance. I was never in the running – although I was told I had to go to Sunday School I wasn’t made to go every week. In the end there were two girls who had the same perfect attendance, and in the end they had to draw lots to find out who got to be Rose Queen. The one who didn’t win had to be a Maid of Honour like the rest of us, wearing a long dress and carrying the Rose Queen’s train, at not only the coronation of our Rose Queen but at the coronation of all the other Rose Queens as well. We also got to ride on a float in the Whit Walks, which I quite enjoyed because it meant I didn’t have to walk that year, and I was never very fond of walking, even as a child. 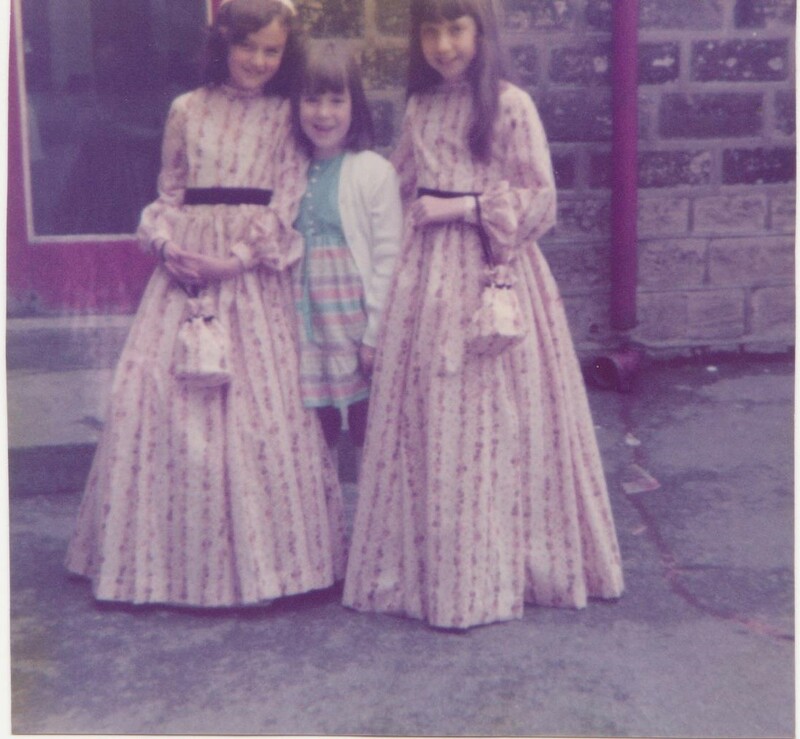 So the picture here is from June 1978 and shows me and my best friend Helen in our ‘Maid of Honour’ dresses. I think the picture was taken outside the church hall. My sister is in the middle, in her ‘Whitsun’ dress. Helen and I were born four months apart and were friends from infancy because our mothers were friends. We went to the same school and the same Sunday school and were pretty much inseparable until the point we moved to Canada. I never really had a best friend in quite the same way after that, and she’s someone I would dearly love to find again, but have failed to do so, despite many Google searches. Sometimes you have to accept that people in your past stay in your past. Anyway, being a Maid of Honour for the Rose Queen was quite possibly the most exciting things that happened to me in 1978, in a life that consisted of school, Brownie meetings, Sunday School, watching TV, playing with dolls and weekend visits to my dad’s house. One of my favourite TV shows was Top of the Pops, which would have a weekly count down on all the chart hits, and it was filmed in a studio where they would roll out some of the top artists of the day performing their hit song to a studio audience. I was already a big Abba fan, and they featured frequently on ‘Top of the Pops’ during the 1970s, but generally in a video and not a live performance because of the distance involved in travelling from Sweden. This year’s selected song is one that I remember watching on ‘Top of the Pops’ this year, but for once it’s not Abba. 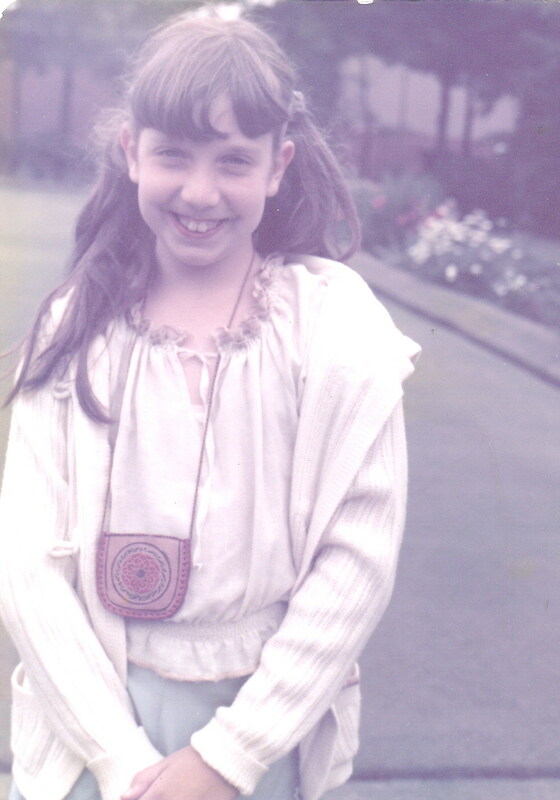 As an eight-year-old I was a very ‘girly girl’. I liked wearing pretty dresses (one of the reaons I liked Whitsun so much; I always got a new dress), I didn’t like getting dirty or climbing trees and I thought boys were noisy and uncouth. But I saw this video, featuring a tiny but dynamic woman sporting an enormous bass, and something awoke inside me. Something that would grow up to be a wannabe rock chick. It’s entirely down to Suzi Quatro that I now play bass guitar and like strutting my rock chick stuff at open mic nights, and it was this song that first brought her to my attention – “If You Can’t Give Me Love”, which hit the UK charts in the spring of 1978. The video is the performance I remember watching on ‘Top of the Pops. Note that the instruments are not plugged in, because all the songs are mimed. I never twigged that at the time. There is only one song that I can feature for 1977, because it had such a profound effect on me, and my life. When I started doing this blog feature I knew that I would eventually have to deal with this one, and to be honest I’ve been rather putting it off, because this song still has power over me. It’s a song that spend five weeks at the top of the UK charts in April 1977. At that time my family had been shattered by my parents’ divorce, and we were all still picking up the pieces. The timeline for that year and the one before is still vague, in my head. I don’t remember exactly when I knew that Daddy was no longer living with us. I remember someone at school asking me if my parents were divorced and my not understanding what that word meant. I went home and asked my mother what it meant when your parents were divorced, and to my recollection she said it meant that Mummy and Daddy didn’t love each other any more but they both still loved me and my sister. I remember suffering from nightmares around this time. I did eventually grow out of them, but over 40 years later I can still recall some of them, and at the time they were terrifying. I do remember moving out of the house that had been my home since birth. I can still remember that house, very clearly, and all my memories involve both of my parents, together. I have memories of moving out and then the next memories are of the council flat I lived in next, with my mother and sister, and the house my dad moved into which my sister and I would go to on weekends. People often talk about going back ‘home’ when they go visit their parents, because they are returning to the house they grew up in. I always felt I never had that. A few years after that we moved to Canada with my mother, and we lived in a number of different properties over the next few years. After moving out of the only house I ever lived in with both my parents, I don’t think I lived anywhere that I truly identified as ‘home’ until I met my husband and we bought our first place together. This song happened to come out at a time that made it hugely relevant to me. For a very, very long time – decades, even – I could not listen to this song without reverting back to that lost little girl whose world had been torn apart, and it made me cry. Often it still does. And just a word about the photo. This is from the school year beginning September 1977. My sister had started her first year of infants’ school; I was in my first year of junior school. When siblings went to the same school they were rounded up for a picture together on Photo Day, so parents only had to fork out for one set of prints. For all I know this still happens in schools in the UK, although it wasn’t done that way in Canada. 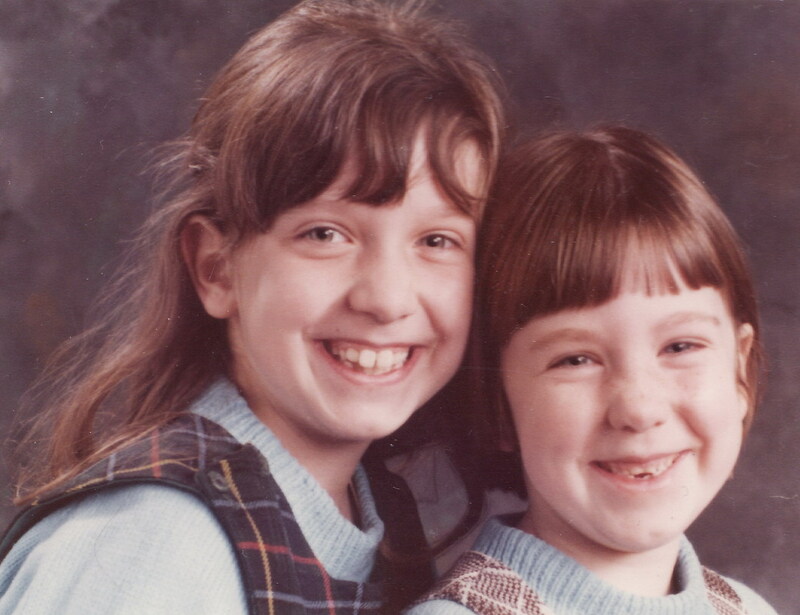 This was the first of the three years my sister and I had our school photo taken together, before we moved to Canada. Note we are both wearing matching blue jumpers and pinafore dresses. My mother laid out our clothes for school in those days and we’d get dressed in whatever she picked out. She liked dressing us in the same outfits. We are evidently still young enough in this picture to comply with this; we objected when we got a bit older. So here’s the song for 1977, now that I’ve bared my soul about it: ‘Knowing Me Knowing You’ by Abba. The last round-up was three months ago, and quite a lot has been going on in my life since then. I got made redundant from the day job in July, but fortunately managed to find a new job after just a few weeks of intense job-hunting. But now I am in the position of being the new girl, which feels strange after nearly 13 years in the same organisation, and it is quite intensive. Hence, with all this real-life stuff to deal with, not a lot of writing has been happening. I may as well take the opportunity to promote OUTPOST H311, which is doing reasonably well sales-wise at the moment. If you like Nazi zombies, this is a book for you. Tell your friends. There aren’t enough Nazi zombie books in the world, and this one attempts to address that. As already mentioned, not much writing going on. There will be a sequel to OUTPOST H311. That’s all I can really say at this stage. And that’s about it for news this time. I hope to see you again next month.